HomeBlogDoes the Pacific Northwest Have Termites? Those of us who live in the Pacific Northwest have a few wood-destroying organisms to contend with: Carpenter Ants, Wood-Decay Fungus (wood-rot), and Termites. Here, we’re going to focus on our regional termite problems. And to understand termites in their proper light, it should be noted that in the natural environment termites have a vital role to play, breaking down wood and other cellulose into soil. It’s when they take their mission to our homes that all this becomes a very nasty problem. For some time, a rumor had gone around that there were no termites in the greater Seattle area or Pacific Northwest – which couldn’t be further from the truth! While we don’t have as much termite damage as found in the southern states, there are actually two major types of termites—Dampwood termites and Subterranean termites. Termite damage to our homes is a very real threat. It’s the Subterranean termites that are most ‘famous’ throughout the U.S. and we’ll get back to them in a moment. First, let’s take a look at Dampwood termites, which are somewhat unique to the Northwest. Dampwood termites are the largest termites in North America by size. As such, each termite in a Dampwood colony can consume a lot of wood fiber. Dampwood termites, as their name implies, confine themselves to nesting within and eating wood that has a high moisture content, even wet wood. In the forests, Dampwood termites live in stumps and fallen trees that are damp from rain and contact with the moisture of the forest floor. Here, along with wood-rot and other insects, they turn the wood cellulose into a rich mulch allowing the forest to regenerate. 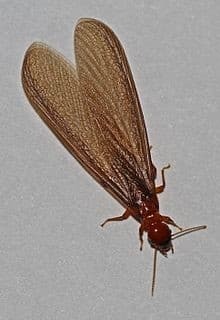 You may notice the winged forms of Dampwood termites flying in late August or September—usually in the evenings. Fortunately, Dampwood termites are so dependent on moist or wet wood that they are not often a major threat to homes. When Dampwood termites are encountered in a house structure, there is always going to be a moisture problem such as a leaky roof, plumbing leak or moist soil brought up against siding outside the home. Dampwood termite extermination and/or termite control is accomplished by solving the moisture problem and, only then, possibly supplementing the moisture control with a termiticide application. It should be noted that dampwood termites can live in decorative stumps or logs in the landscaping surrounding a well-built home without threatening it in any way. Subterranean termites cause a significant amount of damage throughout Washington. “Sub-terranean” means ‘under-soil,’ meaning these termites situate their colony underground where they have a constant source of moisture. And, it is from their protective underground burrows that they sneak up to the surface looking for wood cellulose to consume. Unlike dampwood termites, they get their moisture underground, so they are perfectly comfortable traveling great distances above ground, finding perfectly dry, sound wood that quickly becomes their meal ticket. Subterranean termites are significantly smaller than dampwood termites, but they more than make up for it with massive colonies, their sheer numbers tunneling and destroying wood. But more important, subterranean termites, being small, build tiny tunnels up into houses and other structures where they can easily go unnoticed. These ‘mud tubes’ (or enclosed tunnels) shield them from harm, maintain the moisture they need, and allow them to excavate wood cellulose throughout the framing of a home or commercial building. Subterranean termite control is involved. It starts with a careful inspection, often in hard to access places to find where subterranean termites may be gaining access. Subterranean termite treatment involves creating barriers in the soil when it is closest to the house foundation, keeping them from gaining access to the house frame in the first place. Complete termite protection involves a combination of initial inspection, termite extermination (termite treatment) which establishes termite control barriers, and then ongoing (annual) termite monitoring to ensure that termites haven’t found a way around the termite barrier treatment. Cascade Pest Control has specialized in northwest pests and their control since 1979. Cascade has decades of experience in termite inspections, termite extermination and control. Cascade Pest Control is equipped to apply protective termite barriers, including termite pre-treatments at the time of building construction.